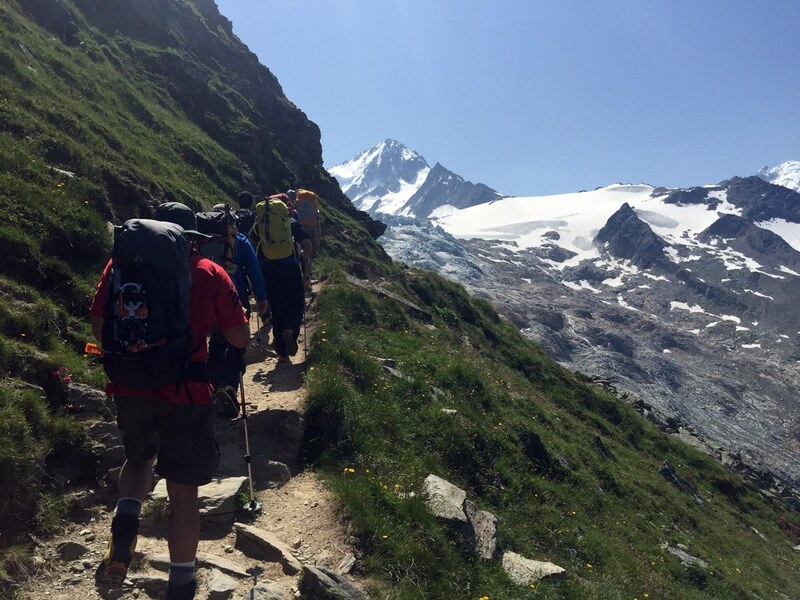 Mountain Lake villages amongst beautifully chiseled peaks in the heart of the European Alps, This historical seven-day trek starts in the quaint mountain village of Chamonix, France and ends in picturesque Zermatt, Switzerland. Luxurious in it lodging and dining, as we stay in newly modeled huts and lodges that perched on the side of a mountain or glacier. At these huts, three course meals are offered and you will have time to relax on the deck with a glass of wine or your choice of beverage. Hut accommodation includes down comforters and pillows so packs are nice and lightweight. 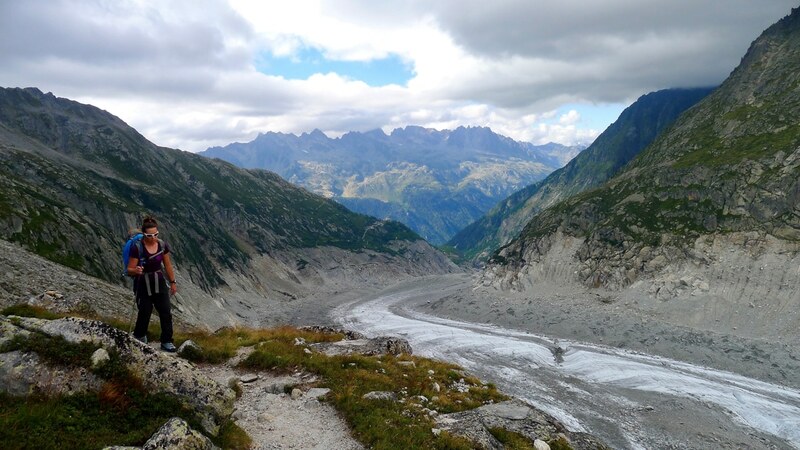 Of course this walk is more about terrain then lodging and truly defines what makes the European Alps, the historical cannon of alpine beauty. This trek requires no previous mountaineering skills ( but we will utilize crampons to cross twelve non crevassed glaciers). 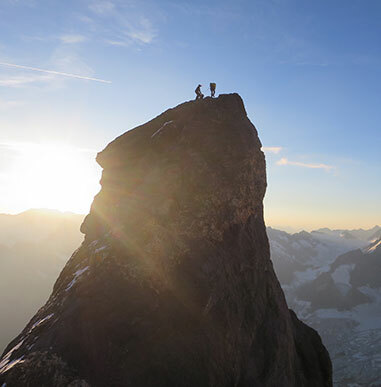 The Haute Route is 60 percent trail and 40 percent glacier travel and each day you will trek though high mountain passes, while skirting through alpine meadows and wildflowers. 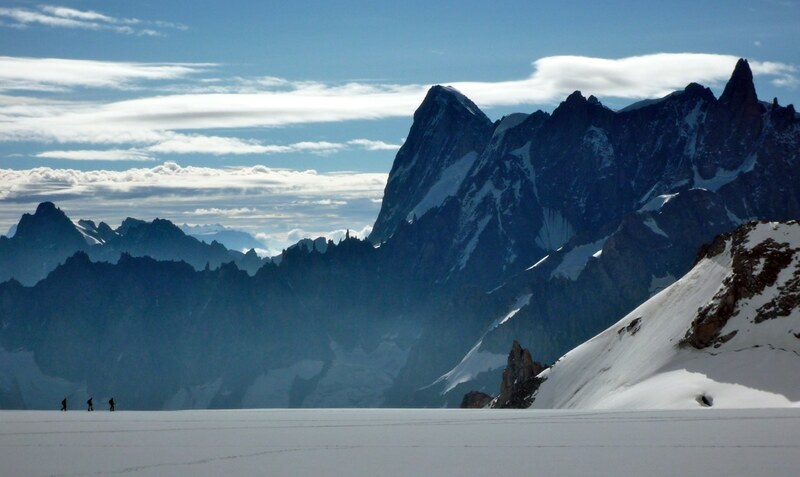 On our first day, as we leave Chamonix, we will get the quintessential views of Mont Blanc and the Le Tour glacier as we trek up it’s lateral moraine. Our high point will be reached near the end of the trip when we climb to the Pigne d’Arolla. 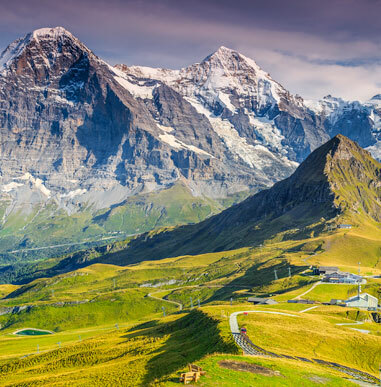 At this point, we will get stunning views of many 4000 meter peaks including the Matterhorn, the Monte Rosa and the Wiesshorn. This is a trip not to be missed and is for any person who enjoys a physical challenge all the while experiencing pristine views and a historical mountain adventure. This trips starts in downtown Chamonix, France. You will stay at a centrally located three star hotel in the heart of the town. 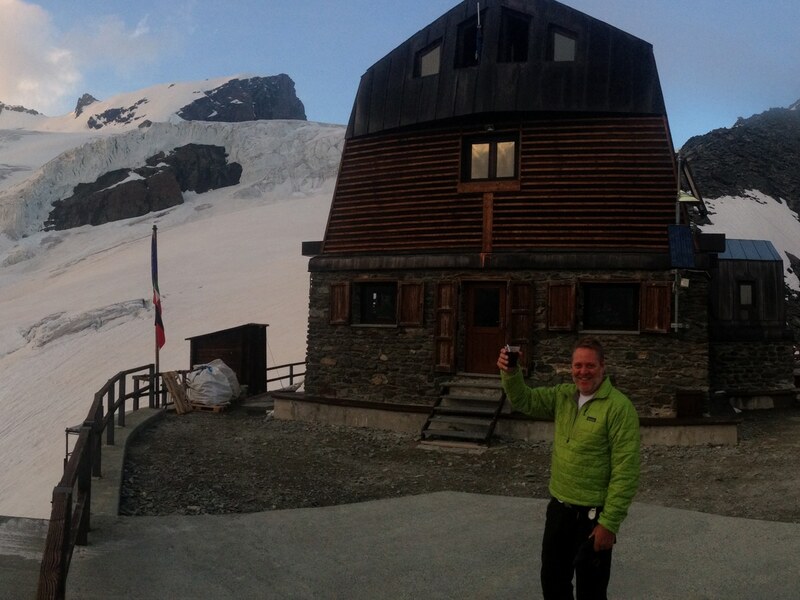 Once we depart Chamonix we will be staying at mountain huts in both France and Switzerland along the way. These mountain huts have toilets, bedding, electricity, and some offer a hot shower. Arriving in Zermatt, we will be staying at three star hotel in downtown with a deck that has views of the Matterhorn and surrounding peaks. Your luggage will be transport from Chamonix to Zermatt by a private drive and ready to meet you at the hotel at the end of the trek. 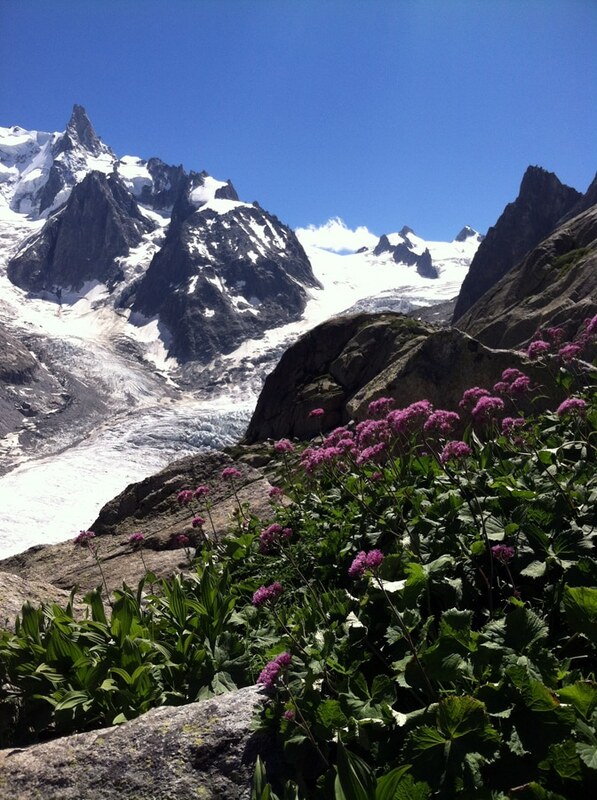 The Haute Route Trek is by no means difficult or strenuous. 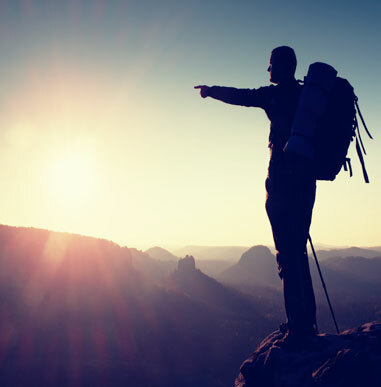 Hikers should be prepared for 6-8 hours of travel a day with up to 3,000ft of vertical gain during a given day. The mountain hut system allows us to carry lightweight packs and lets our bodies rest and recover in the evening with a cozy setting. Trekkers who have completed the Everest Base Camp Trek will find the Haute Route to have similar length days but at lower altitude. 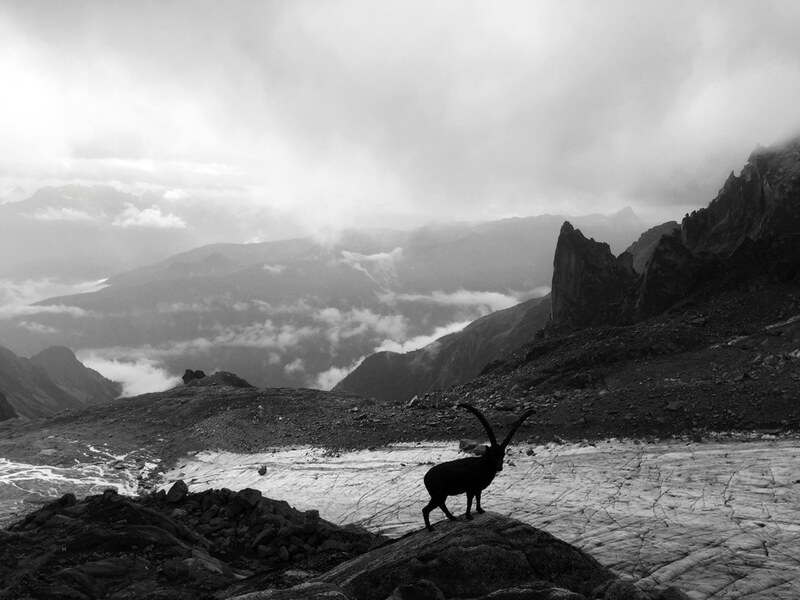 Hikers may be challenged by some of the technical skills associated with glacier travel but our guides will provide coaching with these techniques. The terrain is relatively benign and beginner friendly and no previous mountaineering experience is required. On the first day of the trip our guides will give detailed instruction on how to use crampons and the ice axe along with rope travel techniques. Compared to other multi-day treks around the world, we get to leave some key pieces of equipment behind allowing our backpacks to be much lighter. A typical hiker’s backpack on this trip will weigh between 15 – 20 lbs.